Bangalore- 10 December, 2013: The Akshaya Patra Foundation, Bellary Kitchen, has been conferred with the CII National Award for Food Safety 2013 for its holistic approach in establishing, running and managing efficiently the Food Safety and Quality Systems. Mr. Shridhar Venkat, Executive Director, The Akshaya Patra Foundation, Sriman Suvyakta Narasimha Dasa, Unit Head – Vrindavan and Mr. Chetan D, Manager – Operations, Akshaya Patra Bellary, received the award in New Delhi. Confederation of Indian Industry (CII-Jubilant Bhartia Food & Agriculture Centre of Excellence) in partnership with its stakeholders and knowledge partners had launched the first ever CII National Award for Food Safety back in 2010. The objective behind this award is to raise awareness levels, promote Food Safety Practices and recognise role models with a view to upgrade Indian food companies in the Micro, Small, Medium and Large scale sectors to world class levels. The assessment criteria for small, micro, medium and large scale companies, involved in production and service of food products are based on national and international standards of Food Safety Systems and have been customised keeping the nature of business, size, sector, structure and maturity levels in mind. It involves a feedback to the participating companies by harnessing the expertise of highly experienced, trained, technical food professionals and setting examples of best in class. The process is generally done with an exhaustive questionnaire with 400+ questions which belongs to various topics and sub sections like Regulations, Social Compliance, PRPs, HACCP, GMP, Change Management etc., and their management in a very effective and efficient way. Speaking on this occasion, Mr. Muralidhar Pundla, GM, the Quality and Process Excellence department said "we are extremely honored to receive this award. The Bellary kitchen of Akshaya Patra faired well in all the sections and hence got the award of commendation. Though, we still believe that there is room for improvement. Therefore, our next course of action would be to continuously focus on Continual Improvement activities/projects using proven methodologies like Kaizen, CI Projects & Six Sigma Projects in Akshaya Patra’s operation." The CII National Award for Food Safety was formed to honor organizations for pre-eminence in the field of food safety systems, raise awareness on sustainable success and competitiveness through robust food safety systems and provide guidance to those seeking to achieve it. Based on a process of feedback and review from the stakeholders and in line with the changing market scenario, the assessment model has been duly upgraded to 2013 Revisions. 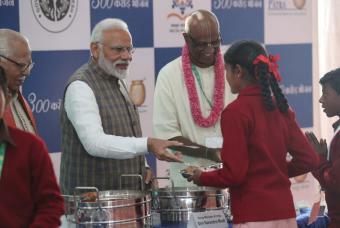 The Akshaya Patra Foundation a secular non-profit organization is in a public private partnership with the Indian government, which implements the world's largest NGO managed mid-day meal programme. Akshaya Patra feeds around 1.3 million children on all school working days and the Foundation's work has created a very wide ranging social impact among the children of poor and marginalized communities who go to government schools in India.